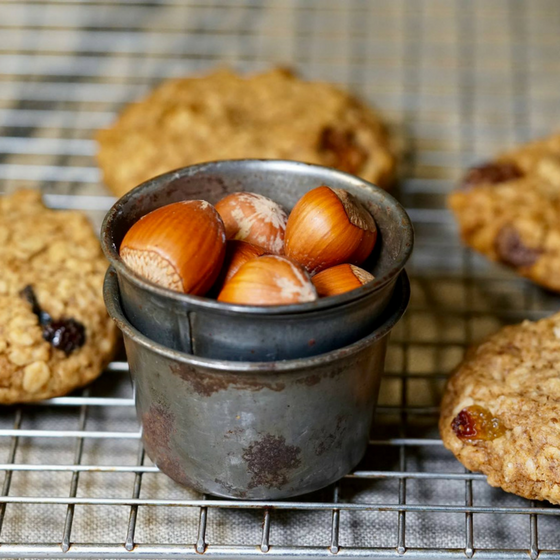 Oatmeal cookies have always been my favorite travel cookies since I started doing recipe development for Starbucks Mexico in 2001. We made multiple recipes for that project and they were delicious but so sugar loaded that it was unreal. I have since tweaked and adapted countless recipes and now that I am 95% gluten free (except for specific recipe testing) I wanted a killer oatmeal cookie recipe that was balanced, chewy, not too sweet, not oily, not sugar coated and not dry or cardboard tasting. My goal is to give you Master Recipes that will be your go to recipes you can build upon and do your own variation. If I had a bakery this would be my cookie of choice. I have not made this cookie vegan or dairy free yet: so before you guys ask me that question: please try my vegan oatmeal cookies (those are not gluten free) or try swapping the butter for vegan butter and egg for a flax egg. The Date Lady gave me the most amazing dates that taste like caramel and this inspired me to create a turtle version using her dates, pecans, chocolate and Maldon Salt. Pre heat oven to 340 F or 170 C. Line 2 baking trays with Silpats. In a medium bowl: sift flour + baking soda, salt and spices. In a mixer with a paddle attachment: beat butter + coconut sugar until combined well (the goal is just to blend: not aerate as the cookies will spread if you do so). Add vanilla and egg and mix well. Add oats and combine. Add sifted flour mix and stir well. Add dates, chocolate, pecans, or desired add ins and mix well. Shape cookies with a scoop (I use a size #24) and place onto prepared cookie sheets: I place 4 lengthwise X 3 crosswise and flatten them out lightly. Sprinkle with Maldon Salt. Bake until golden for about 8-10 mins. They should be soft and chewy in the middle. Note: as they cool on the tray they will continue to bake, so make sure you don’t over bake them! Variations: I made these cookies with: pecans, chocolate and dates from The Date Lady and loved this “turtle” combination. I also made these with dried mangos with chile from Mexico and they were awesome! I also made a mix of yellow raisins, dates, dried apricots and added “unpumpkin” pie spice from The Raw Spice Bar to the cookies and they were amazing. I added 1 teaspoon instead of the cinnamon and nutmeg. Please share the love on your social media and rate the recipe when you make it. Estimada Chef Vanessa Musi, le agradezco el tiempo que se toma para éste hermoso detalle gracias por ser una gran mujer, un magnífico ser humano y un ejemplo a seguir. Me sorprendes con cada receta nueva. Thank U so much Vannessa, I wil enjoy this recipe! ya que en la mayoria de las recetas vegans se usa mucho el coco y sus derivados no se con que otro ingrediente se puede sustituir, lo mismo el huevo. quedo en espera de comentarios. I made these cookies and they are truly delicious! Just the perfect combination of chewy and soft with lots of flavor. I added raisans and pecans,didn’t have chocolate at that moment but there were perfect like that. You can really taste the nutmeg and they are not grease at all. Definitely they will be a favorite to my family from now on,my little girl loved them. Next time I will try dates and chocolate. Thank you so much Isamary! I would love it if you can rate the recipe with the stars and share on social media.. That would help us spread the love! Many thanks! I am so glad you liked them! Mangos with chile?? Wow!! I have to try it!! Hey Buddy!, I found this information for you: "HEALTHY OATMEAL COOKIES OF MY DREAMS". Here is the website link: https://www.vanessamusi.com/oatmeal-cookies-dreams/. Thank you.